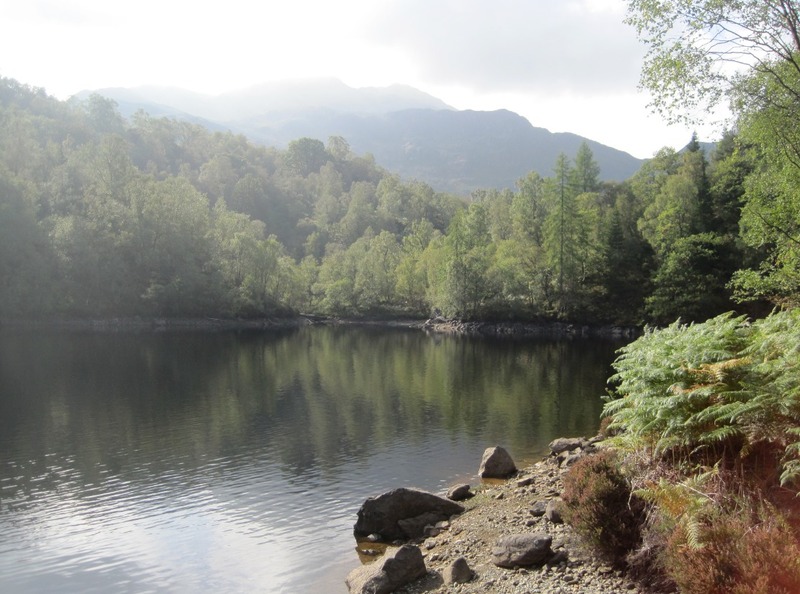 Scotland has been enjoying some fantastic autumn weather, and one weekend my family and I drove up to Loch Katrine in the district of Stirling to enjoy the beautiful views of the Trossachs. 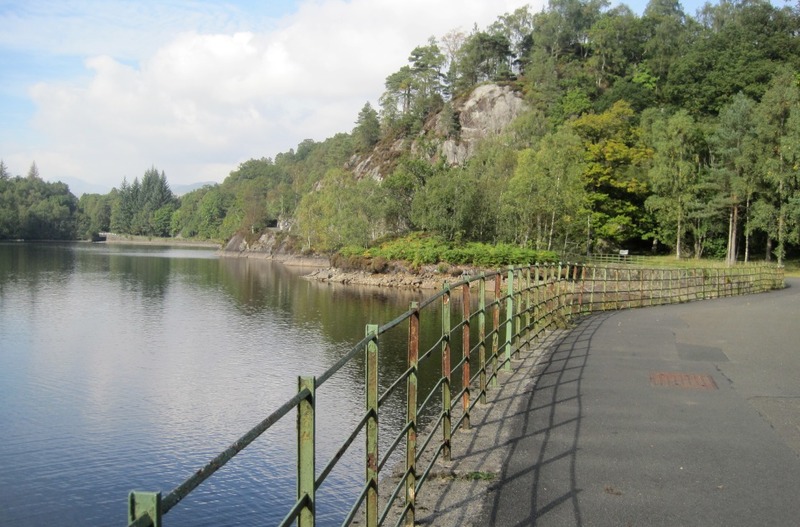 This is a perfect place to walk at a leisurely pace surrounded by stunning scenery, and if you feel like relaxing even more you can hop aboard the Steamship Sir Walter Scott for a cruise around the loch! Half of our group opted for the boat ride, and the other half chose to walk. Being one of the walkers, I was able to get this photo of the steamship just setting off. It looked very festive with its colourful bunting, and when it met another boat on the loch (the Lady of the Lake being the other) it would set off a loud horn as if to say, “Coming through! 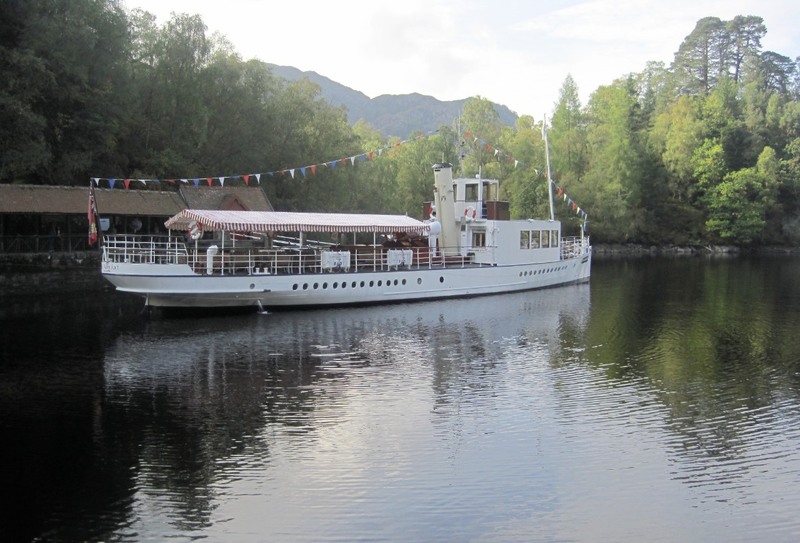 Make way for Sir Walter Scott!” This Victorian steamship has been cruising the loch for over 100 years, with regular tours running four times a day from late May to late October. The Lady of the Lake is a smaller, newer boat, and it does three tours a day during the same period. 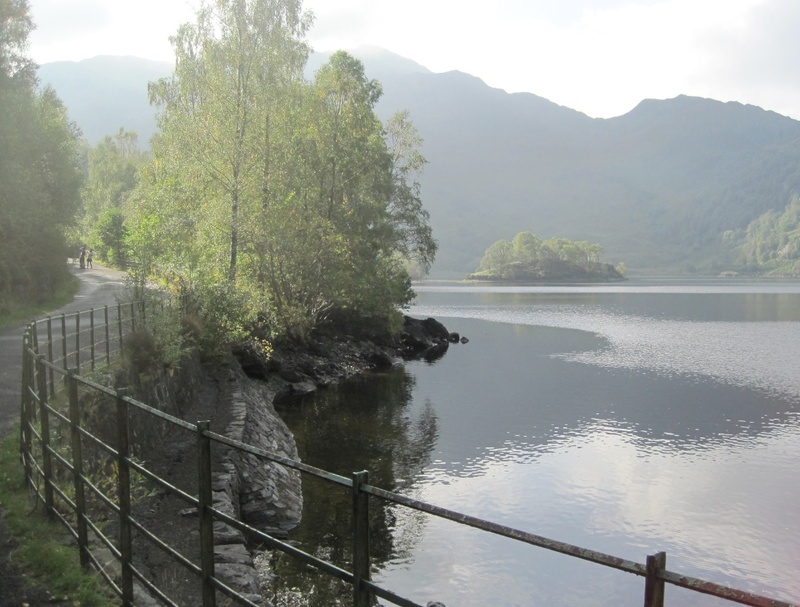 The path for walkers is wide and flat initially, curving round the side of the loch with stunning views over the water. When the weather is good, the path is hugely popular with dog walkers and cyclists. You can even hire bikes there, so no need to bring your own! I think it’s possible to walk or cycle right round the entire loch, but I must admit I’ve never done it. After a while the path moves away from the water and gets quite hilly! 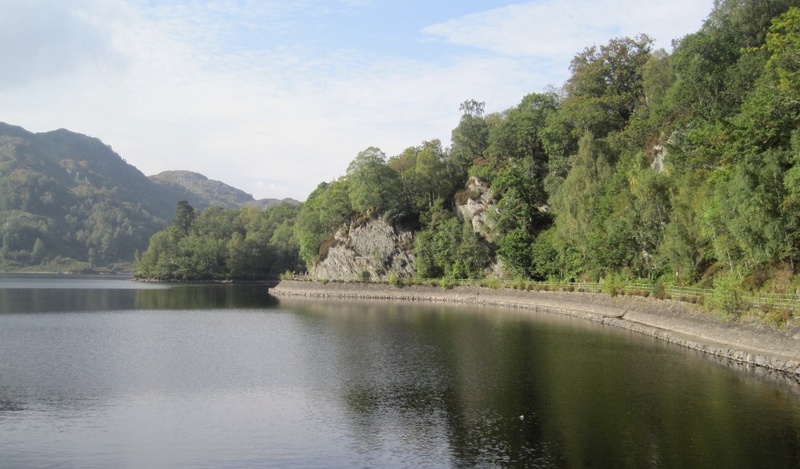 Loch Katrine is the main source of drinking water for the city of Glasgow and surrounding areas. 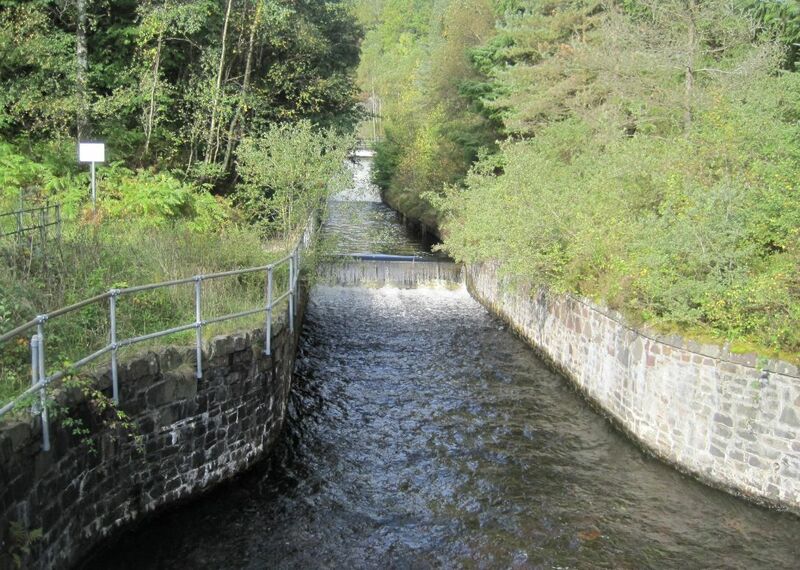 Two 26-mile-long aqueducts and 13 miles of tunnel channel the water to a treatment plant in Milngavie just north of Glasgow. Because Milngavie is 400 metres above sea level it provides enough pressure to supply all of Glasgow’s water without pumping. This system of water provision was designed and built by Civil Engineer John Frederick Bateman, and the first aqueduct was opened by Queen Victoria in 1859. 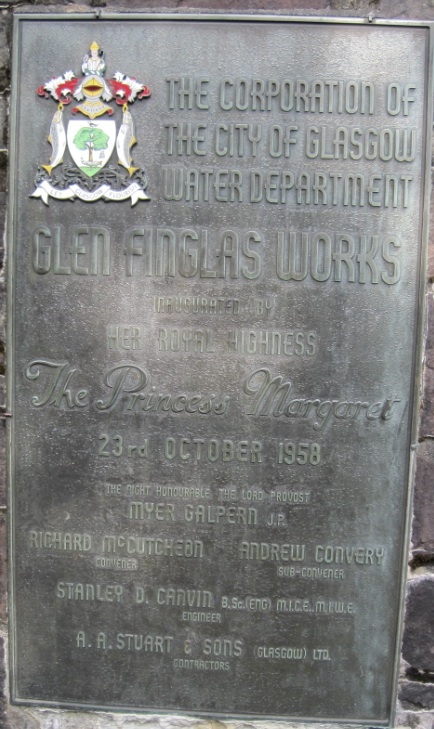 The second one was completed in 1901, and in 1958 another tunnel was completed under Ben A’an bringing water from the Glen Finglas Reservoir. The waterfall above is Glen Finglas water channeling down into Loch Katrine. This plaque stands near the waterfall and commemorates the opening of the tunnel and the people who made it possible. Since the tunnel had been dug underneath a mountain, this was quite an achievement! HRH Princess Margaret performed the official opening. 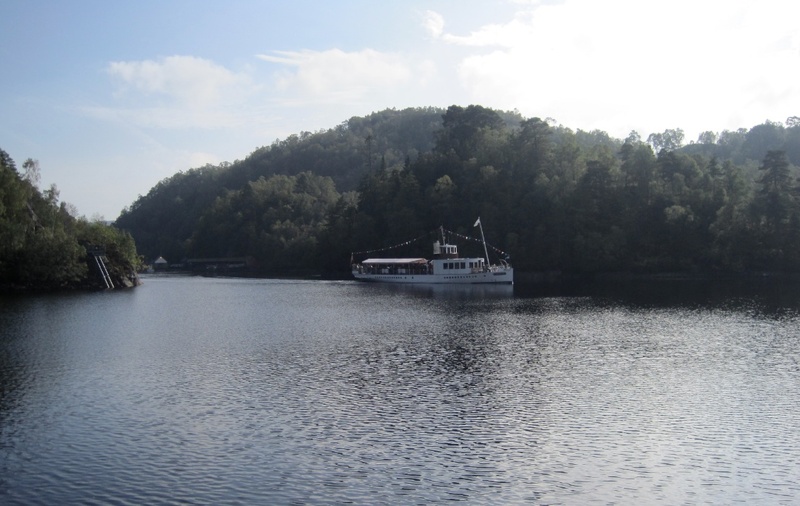 As my daughter and I walked around the sparkling loch we saw the steamship catching up and passing us. It was going at a surprising speed! It circled the whole loch in about an hour, and when we saw it heading back to dock we knew we had to rush back to meet it. I couldn’t resist taking a few more photos of the amazing views as we retraced our steps. As you can see, we couldn’t have had better weather! There are only a few more days in October to take a ride on the steamship Sir Walter Scott as its last sailing is on the 20th. I’m sure over the next few weeks Loch Katrine will become even more beautiful as the trees turn gold in the autumn chill. I’ll have to go back again soon! Friday April 20th is a special day for me. It is the first birthday of my Blog for Kids! I have had a lot of fun writing about things I care about over the past year, and it’s been great to get responses from you, too! 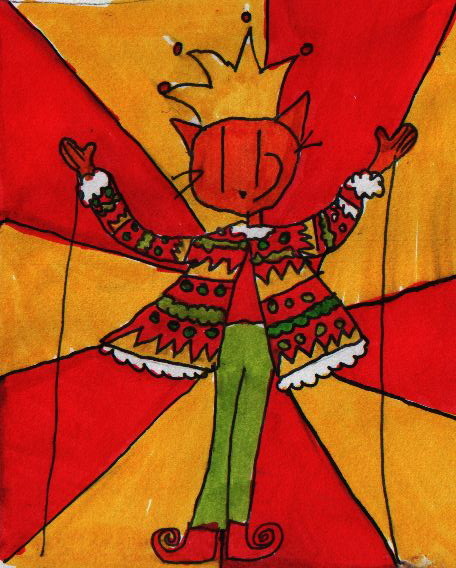 The little cat above is a drawing Anna did for her 10th birthday party, so I thought it was a good way to start this post. To celebrate my blog’s birthday I have decided to write some GOOD NEWS stories. 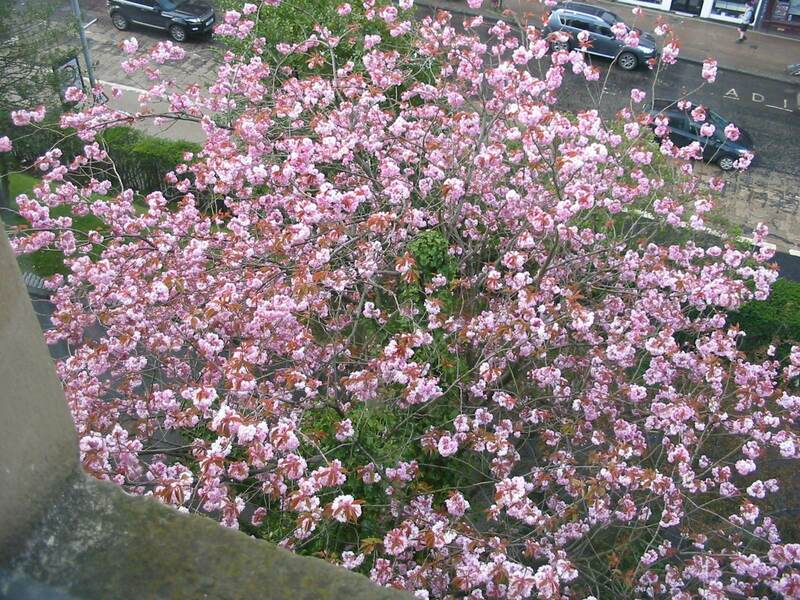 For example, I always get a special thrill each spring when the giant cherry tree outside my house comes out in beautiful pink blossom. This is the view from my window at the moment, and it never fails to cheer me up, even on a rainy day! Speaking of pink things, I have amazing news that on April 11th, over 8 MILLION people around the world dressed in pink to show that they were standing up against bullying. Isn’t that fantastic? If you want to see some of those people in action, check out the City News Day of Pink video HERE. It’s great to see so many young people working together for a good cause and having fun at the same time. In one highschool in Toronto they even made special pink food in the cafeteria! Here is another wonderful reason to celebrate. 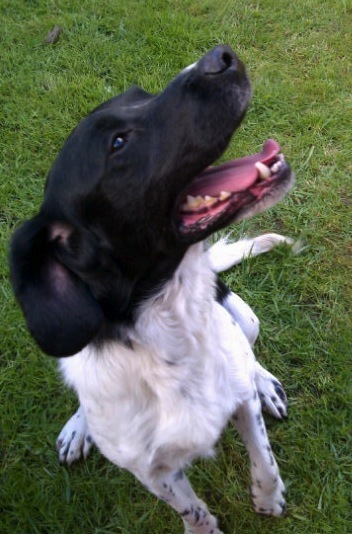 His name is Alfie and he is a rescue dog recently adopted by a friend of mine. Isn’t he gorgeous? He has only just arrived in his new home, so I hope he settles in well and becomes a special member of the family. I love dogs so I hope one day I’ll get to meet him! The month of April marks another first birthday – that of the Guardian Children’s Books Website. This is a brilliant site full of book reviews, video interviews with authors, quizzes, the latest children’s book news and even drawing tips! You can sign up and join in the action, writing book reviews yourself and getting involved in discussions. To find out more about the site and how to join, click HERE. In some parts of the world, people live in such isolated and hard-to-reach places that they can’t enjoy the simple things we take for granted – like books. I recently discovered (from @shedworking on Twitter) that in Venezuela there is a clever new way to bring books to children in remote mountain villages. Book mules! These animals are very tough and can be used to carry heavy loads along treacherous mountain paths where a four-wheeled vehicle couldn’t go. 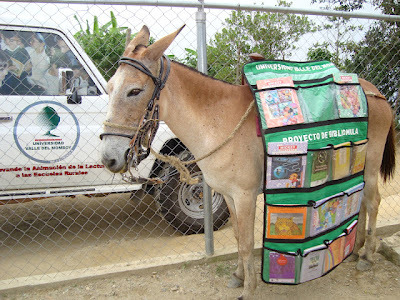 When the book mule arrives in a village, the children all cry “Bibliomulas!” and race to find something to read. In a place where there are no libraries or bookshops, you can imagine how exciting it would be to see the mule coming! In some of these places there is starting to be some mobile phone reception, so the mules can carry laptops to give the villagers access to the internet. Cyber mules! This story was reported on a BBC Radio 4 programme called From Our Own Correspondent, and you can read a big article about it HERE. I think it’s brilliant! If you live in the northern half of the globe, March 20th is officially the first day of spring. After a long, cold winter, the return of blue skies and warmer temperatures is a cause for great celebration! It’s the time for snow to melt away, for migrating birds to fly home again, and for hibernating animals who have been sleeping all winter to wake up. Tiny white snowdrops and golden daffodils start to appear, and soon the trees are covered in blossom! Spring is definitely my favourite time of the year. Many artists through the ages have tried to capture the delight and beauty of spring. 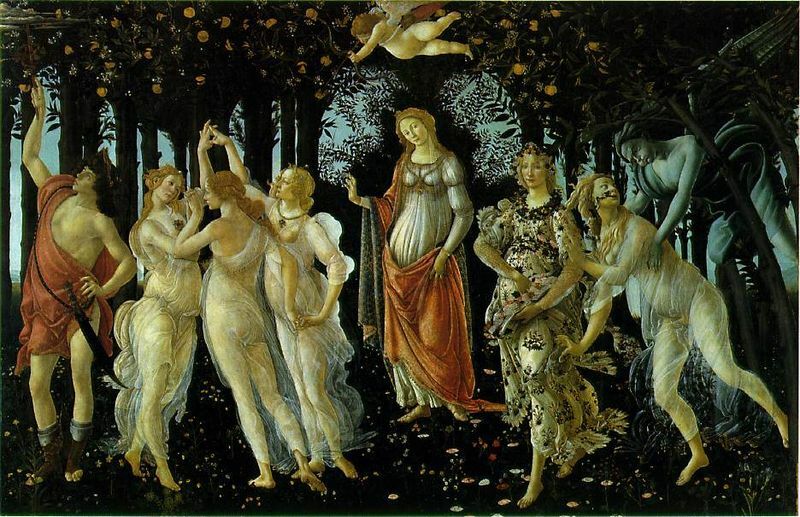 During the Renaissance in Italy, the painter Sandro Botticelli created a giant work of art called Primavera (“spring” in Italian). In it he shows the goddess of spring in an orange grove surrounded by nymphs. Above her you can see a little winged boy with a bow and arrow. He is not just any naughty child – he is Cupid, and anyone who is hit by his little arrow will fall in love. About 100 years later, another Italian artist, Giuseppe Arcimboldo, created strange portraits of people whose heads seemed to be made of vegetables or flowers! 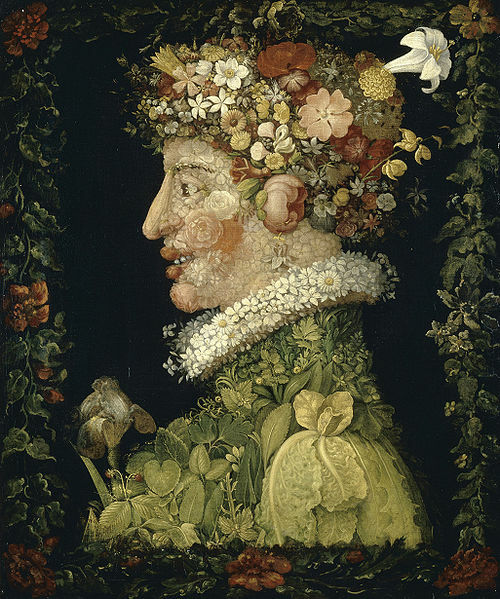 His version of Primavera is a woman with roses for ears, a leafy green dress and all sorts of wild flowers for hair. In the 1890s a Czech artist called Alfons Mucha became very successful in Paris painting beautiful women in flowing gowns for theatrical posters, book illustrations and advertisements in magazines and newspapers. His style was very distinctive and it soon became known as Art Nouveau (“new art”). 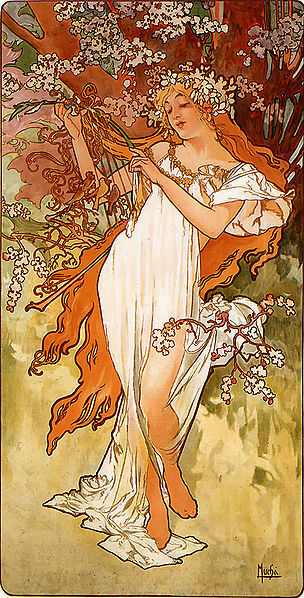 Mucha’s version of spring (Le Printemps) is typical of his most famous work. This curvy, elongated style was adopted by other artists across Europe, including the famous Glasgow couple Charles Rennie Mackintosh and Margaret Macdonald. They designed beautiful interiors using similar elongated female forms in their decorative panels. A good example of this is Margaret Macdonald’s piece, The May Queen, which also has a spring theme! But it was not only artists whose work was inspired by the coming of spring. Antonio Vivaldi, an Italian composer who lived over 300 years ago, wrote a beautiful piece of music (now very famous) called The Four Seasons. In the section called Spring he recreated the sound of wild thunderstorms and gently melting snow. If you want to listen to Vivaldi’s amazing musical Spring, click HERE. Perhaps as you listen you will be inspired to create your own spring work of art!